In the early days of World War II, Ada and her younger brother Jamie live in London with their abusive mother. Ada receives particularly more brutal abuse than her brother because Mam is ashamed of her club foot and won't ever let Ada go outside. Mam makes Ada crawl around on the ground and punishes her by forcing her to sleep in a dank, dark cupboard filled with roaches and other filth. When worries over London bombings by the Nazis start circulating, parents send their children away to safer areas of the country. Jamie of course is sent away, but once again their mother refuses to allow Ada to go. Ada, however, finds a way to sneak off and join Jamie while their mother is away at work. Susan, the woman who is forced to take Ada and Jamie, lives in a beautiful house in the country and initially says she doesn't want the two neglected siblings. But even with her resistance, Susan shows them more kindness than their mother ever did. 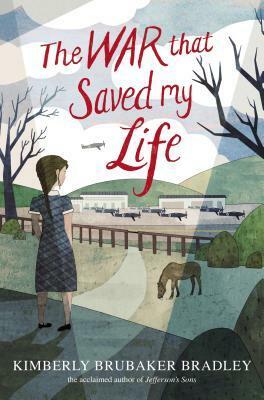 Slowly, as Ada begins to venture outside, ride horses, make friends, and even help watch out for German spies, she discovers the humanity that her mother denied to her as a result of her cruelty and shame. Often when students are asked to read a historical fiction, they immediately recoil and shrink back in terror. If they don't say it outright, the looks on their faces are enough to hear their thoughts: "Please don't make me read this boring book!" The War That Saved My Life is a different breed of historical fiction, though. It's a page-turner. It's both a challenging and accessible read. But more importantly, it is a satisfying read. The abuse that Ada and her brother experience only happens in real-time for a very short part of the story. The remainder of the narrative involves Susan's attempts to repair these broken children. And so, readers feel the satisfaction of knowing that Ada and Jamie's lives are being vindicated. 1) Mam's treatment of her children was so cruel that it bordered on unbelievable. Her behavior felt more like that of a cartoon villain than a character in a serious historical fiction. Perhaps that was by design in order to make Ada and Jamie's experience living with Susan more satisfying, but it did feel a bit off-putting. 2) Ada begins the story completely illiterate and only later in the story does Susan begin teaching her to read. Her learning to read is not elaborated on much in the narrative -- it's really only on the periphery -- so the fact that this story is told by Ada in first person POV, who uses very sophisticated language, is a tad unbelievable. Perhaps if her literacy journey had been more on the forefront of the narrative, this might have made more sense, but as it was, by the end of the story, Ada still didn't know how to read and write that well. Those are my nitpicky criticisms of the story because overall, I really enjoyed it and found myself staying up late to read it. Like Laurie Halse Anderson's Fever 1793 and Ruta Sepetys' Between Shades of Gray, I think this will be one of my go-to historical fiction novels I hand to students who don't like historical fiction.